Start of the trail near downtown Snohomish. 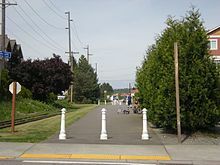 The Snohomish County Centennial Trail is a 30-mile-long (48 km) rail trail in Snohomish County, Washington, connecting the cities of Snohomish, Lake Stevens, and Arlington to Skagit County along the corridor of Washington State Route 9. The trail, administered by Snohomish County Parks and Recreation on the former right-of-way of the Seattle, Lake Shore and Eastern Railway, comprises a 10-foot-wide (3.0 m) non-motorized trail and a 6-foot-wide (1.8 m) equestrian trail. The first segment of the corridor was opened in 1989, the centennial of the statehood of Washington, and the final segment between Arlington and the Skagit County line was opened in 2013. The trail begins as a continuation of the Snohomish River Trail at the intersection of Maple Avenue and Pine Street in Snohomish, named the Snohomish trailhead. The route travels northeast along Maple Avenue, which becomes Machias Road past Snohomish city limits, and the Pilchuck River to the Pilchuck trailhead, located south of an underpass of U.S. Route 2. The trail continues north into Machias, where it passes through the Machias and 20th Street trailheads before turning northwest as the railbed approaches Lake Stevens and an underpass of Washington State Route 92 and its trailhead. The Centennial Trail travels towards Lake Cassidy, where it passes the Rhododendron trailhead, named for the state flower, and the Lake Cassidy Wetlands Park trailhead. The trail continues northwest under 84th Street and Washington State Route 9, the former of which has its own trailhead. The route begins paralleling 67th Avenue NE as it enters the Quilceda Creek watershed at the Armar Road trailhead south of Arlington. The Centennial Trail and 67th Avenue enter Arlington city limits at an intersection with Washington State Route 531 before the roadway continues north into Downtown Arlington after an underpass with Washington State Route 9. The route continues through Downtown Arlington along West Avenue before a former railroad trestle carries the trail across the Stillaguamish River and towards Bryant along Washington State Route 9. The Centennial Trail passes its final trailhead, the Nakashima Heritage Barn & Centennial Trail North, before ending at the Skagit County line south of Lake McMurray. The Centennial Trail runs on the right-of-way of the Sumas Branch of the former Seattle, Lake Shore and Eastern Railway, built in 1889. The railway connected Seattle with Canada and linked eastward toward Stevens Pass with mail, freight, and passenger service. The line specialized in transporting timber, lumber and metals, and also served tourists visiting Monte Cristo, the Stillaguamish River, and the Big Four Inn at the Mountain Loop ice caves. Later purchased by Northern Pacific then Burlington Northern, the Hartford (Lake Stevens) - Edgecomb (Arlington) section was abandoned 1972 and the Snohomish - Hartford (Lake Stevens) section was abandoned in 1987. The rail trail project was first conceived in 1982, and development of the trail began in 1989 during Washington State's centennial. The trail was designated a National Recreation Trail in 1992. An additional 10-mile (16 km) section of the current 17.5 miles (28.2 km) opened in April 2005.A section of the trail extending approximately four miles northward from the City of Arlington to the unincorporated Town of Bryant was opened in November, 2010. A new section which has been called the "Gap" was completed in October 2011. This portion of the trail extends the trail from the Armar Road Trail head 1.2 miles to the Arlington City Limits. The section of trail from Bryant to the Skagit County line was opened officially on Nov 3, 2012. A future phase of the trail may connect with the Sammamish River and Burke-Gilman trails, both of which share the same right-of-way. Snohomish County plans to extend the trail southward to Woodinville and eastward to Monroe. There is a host of public art installations along the trail. The newest installation is a "History Quilt" on the Nakashima Barn, depicting the historical timeline of the site from native forest, to sawmill, to dairy farm and now a recreational site. Artists Ellen Southard and Teresa Stern, of Site Story, wanted to celebrate the past while highlighting the Nakashima family, who were forced to sell the farm at pennies on the dollar due to internment during WWII. Future interpretive signage will also be featured at the site, and other locations along the trail. ^ Centennial Trail (PDF) (Map). Snohomish County Parks and Recreation. October 28, 2011. Retrieved August 10, 2013. ^ a b c d "Centennial Trail: Snohomish to Skagit County". Snohomish County Parks and Recreation. 2013. Retrieved August 10, 2013. ^ Fiege, Gale (August 10, 2013). "People traveling Centennial Trail, end to end, for 1st time". The Herald. Everett, Washington: Sound Publishing. Retrieved August 10, 2013. ^ "Centennial Trail: Driving Directions to Trailheads". Snohomish County Parks and Recreation. 2013. Retrieved August 10, 2013. ^ Google (August 10, 2013). "Centennial Trail" (Map). Google Maps. Google. Retrieved August 10, 2013. ^ a b c Brooks, Diane Brooks (2005-03-30). "Centennial Trail: The scenic route just got longer". The Seattle Times. ^ "Snohomish Co. Centennial Trail". American Trails. 2013-04-22. Retrieved 2014-08-14. ^ "Centennial Trail Phase 2.1, Arlington to Skagit County (not completed)" (JPG). Snohomish County Parks and Recreation. ^ "North Trailhead of Centennial Trail opens". The Arlington Times. Arlington, Washington: Sound Publishing. November 7, 2012. Retrieved November 7, 2012. ^ Haglund, Noah (September 3, 2013). "Land purchase could lead to a longer Centennial Trail". The Herald. Everett, Washington: Sound Publishing. Retrieved September 3, 2013. Wikimedia Commons has media related to Centennial Trail. This page was last edited on 22 February 2018, at 07:30 (UTC).